For full disclosure, DLD is a project of the Digital Learning Policy Center which is a division of the Alliance for Excellent Education, "a Washington, DC–based national policy and advocacy organization dedicated to ensuring that all students, particularly those who are traditionally underserved, graduate from high school ready for success in college, work, and citizenship." The key phrase, in my opinion, of the DLD mission is this: "to support the effective use of technology." ISTE has been all about making technology transparent for years and long before DLD was even a concept. Because of all of the snow days for schools in the Midwest and Northeast, there has been plenty of conversation of making up those days OR how some students have been able to complete their work because of digital access. All well and good as long as the battery lasts if there's no power and no need of the Internet, but I digress. The point for some, however, is that digital learning is already a very real thing for many students. Anyway, a recent article about technology trends caught my attention, partially because of DLD and partially because of the on-going struggle about technology and what digital learning means, how educators can support and be supported in the effective use of technology, and how we can try to ensure all of our students are ready for success. . .and know how to use the right kind of technology for the situation and do so effectively. In October 2013, Forbes published an article about the Gartner Symposium, which is geared towards business. You know, where prepared kids are going to get jobs. 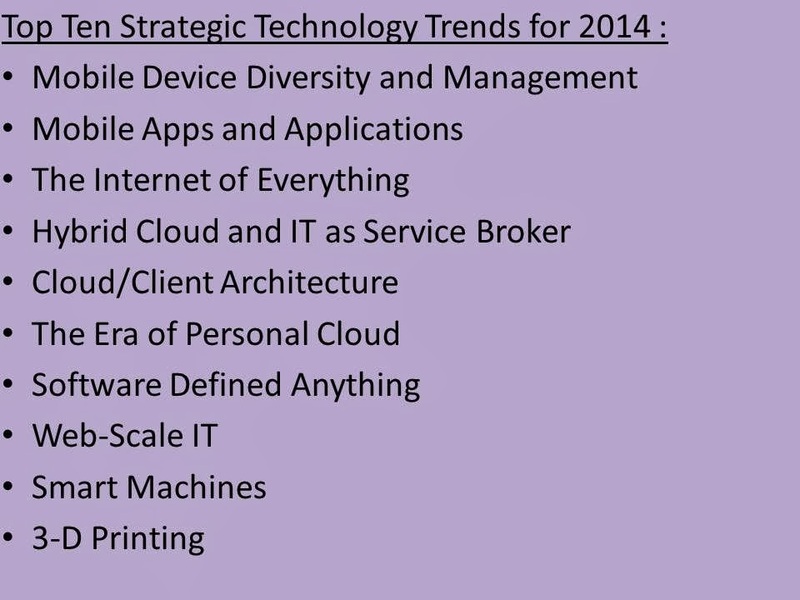 The focus of that article is the top 10 strategic technology trends for 2014 for businesses and work places. 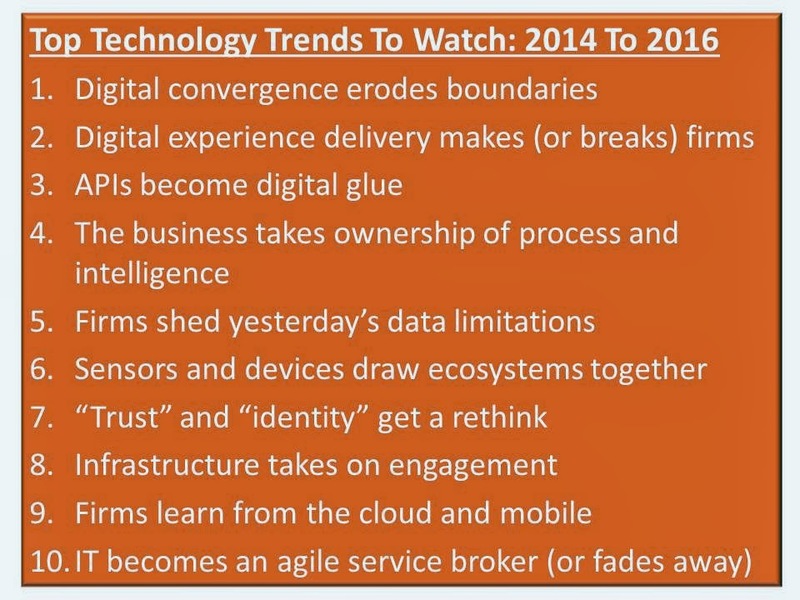 Forbes also published an article in November 2013 about the Forrester Research technology trends to watch for 2014, and beyond. Let's remember that a trend is an indicator of what could happen, of what is developing or a general direction in which something is moving. That distinction of possibility is really important. As I looked at the two lists of top technology trends for businesses and the top technology trends for education, I had a bit of an epiphany but also a confirmation. Business research about trends and what works in the marketplace is as fluid as education research. Research examines what is and postulates or speculates what could be. That's daunting for any educator. We know that technology has an alarmingly short shelf life, so technology that kids are learning in elementary school will be obsolete by the time they reach high school, if not sooner. Remember laser discs? Anyone? Anyone? My thinking is that we examine the trends to make informed decisions about what happens in our classrooms, and acknowledge that what I can do in my school with my kids may not be the same as what any other educator does in his or her school with his or her kids. Why? While digital learning is important, it's the skills for learning digitally that matter, not the tool. While technology trends are informative and help us keep an eye on where and how things might develop, it's what those trends tell us about the critical thinking and problem-solving skills students must have in addition to the practical hands-on skills for using that tool. A million or so years ago I was angling for a job that required me to know how to use a MagCard typewriter. I said I knew how to use one; I didn't. But I knew how to use a typewriter and I wasn't afraid of learning or figuring something out. I spent about 30 minutes going over the thing and skimming the manual, probably one of the few times in my life I've reviewed a manual. Anyway, after that, it was like I was an expert on the thing. Transferable skills is a key component of digital learning. Whether we're talking about the internet of everything, APIs as digital glue, gamification, or any other technology trend, we're really talking about transferable skills. And whatever we do in our classrooms to help kids master those critical thinking and problem-solving skills for practical application, will prepare them for whatever technology trends emerge by the time they need to know it and use it.